Hand-held take-out foods like the burrito have a long history. Before the Spanish colonization of the Americas, indigenous peoples were eating hand-held snack foods like corn on the cob, popcorn and pemmican. In Mexico, the Spanish observed Aztecs selling take-out foods like tamales, tortillas, and sauces in open marketplaces. The Pueblo people of the desert Southwest also made tortillas with beans and meat sauce fillings prepared much like the modern burrito we know today. Cuisine preceding the development of the modern taco, burrito, and enchilada was created by the Pre-Columbian Mesoamerican Aztec peoples of Mexico, who used tortillas to wrap foods, with fillings of chile sauce, tomatoes, mushrooms, squash, and avocados. Spanish missionaries like Bernardino de Sahagún wrote about Aztec cuisine, describing the variety of tortillas and their preparation, noting that the Aztecs not only used corn in their tortillas, but also squash and amaranth, and that some varieties used turkey, eggs, or honey as a flavoring. The word "burrito" appears in the 1895 Diccionario de Mexicanismos, where it is identified as a regional term from Guanajuato and defined as "Tortilla arrollada, con carne u otra cosa dentro, que en Yucatán llaman coçito,y en Cuernavaca y en Mexico, taco" (A rolled tortilla with meat or other ingredients inside, called 'coçito' in Yucatan and 'taco' in the city of Cuernavaca and in Mexico City). This 1895 publication date discredits an apocryphal etymology that the word “burrito” originated during the Mexican Revolution period (1910–1921) in reference to the donkey of one Juan Mendez, a burrito vendor in Ciudad Juárez. The word burrito means "little donkey" in Spanish, coming from burro, which means "donkey". The name burrito possibly derives from the appearance of a rolled up wheat tortilla, which vaguely resembles the ear of its namesake animal, or from bedrolls and packs that donkeys carried. In some areas, such as the Lower Rio Grande Valley, they are called patos, meaning "ducks", again presumably derived from their appearance (cf. Golubtsy). In 1923, Alejandro Borquez opened the Sonora cafe in Los Angeles, which later changed its name to the El Cholo Spanish Cafe. Burritos first appeared on American restaurant menus at the El Cholo Spanish Cafe during the 1930s. Burritos were mentioned in the U.S. media for the first time in 1934, appearing in the Mexican Cookbook, a collection of regional recipes from New Mexico authored by historian Erna Fergusson. Cook rice according to package directions. In sauce pan, over medium heat, add refried beans and chipotle sauce, stir well. Stir in black beans, corn, green chiles, green onions, red onions and cilantro. Cook until heated through. To build, place bean mixture in the center of tortilla, then add rice. To roll them up, tuck in sides. And roll'em up, trying to keep them as tight as possible. Enjoy! Cooks note: These burritos will freeze well. I love the history behind all your post this one is one to try healthy and delicious! 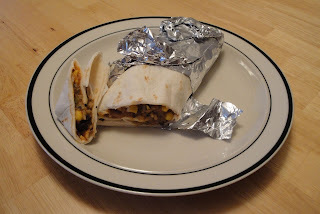 That looks really wonderful--I love black bean burritos, and they are hearty enough that you don't miss the meat! I probably missed it in an earlier post, but who is Debo? I've seen recipes by "Debo" on your blog before. Whoever she is, she knows how to put together good recipes. This is something I'd love to make for my family for a weeknight dinner. Food history is always so interesting. This recipe sounds great! Debo is my boyfriend. Debo is his nickname. Burritos are like Kathi rolls that we eat in our homes. They are delicious way to get all the healthy nutrients in a single roll. I LOVE hand held snacks - who knew that our generation didn't invent it? Thanks for clarifying who Debo was - I always wondered! Hand held foods are fabulous... these burritos sound yummy! I was totally wondering who Debo was to lol!!! I love the different types of rice you used. Great flavors and very filling. Its nice to learn the history to a dish, helps u to understand better food culture. History in general is very interessting and combined with food it comes close to my little world. I wish I could try your burrito right now. Black bean burritos are my favorite. I love black beans so much they are so good I never miss having meat. I love black beans and am trying to add them more to our meals, great recipe! This looks so great! I love burritos, I just never make homemade ones, but I really want to now! All your ingredients sound delicious and I find it especially interesting that burrito means "little donkey" :) how cool! Since they updated the comment section, I can't use the "Reply" button, and my name doesn't look right when I leave a comment. Trying to fix it. Nice recipe Christine and thank you for the vegetarian version of this burrito. Ha this reminds me of my bean burrito diet that I was on several years ago. The amazing thing is that I still enjoy them today. Your mix of black beans and corn is something I need to try, definitely better than my 3 ingredient plain version. Also thanks for gathering the history, very informative. Great historical information, cool. What is pemmican. Love burritos and these sound delicious. I'm a big fan of any burrito that doesn't have meat in it for some reason, and black beans always seem to do the trick for me. What a great blend of flavors these have! Pemmican is a concentrated mixture of fat and protein used as a nutritious food. Great post and YES, the joy of holding it in your hand is one of life's great pleasures! I had black bean burritos for breakfast TWICE at my sister's house last weekend! Your version looks fantastic! I had black been burritos for supper last night. One of my favorite foods! Yours is quite different from mine, but it looks absolutely delicious. I have the feeling I'll be incorporating some of your ingredients into my next burritos. I especially love the addition of the roasted garlic rice. Looks great! They just make for the perfect 'to go' meal.